Casualties of W.A.R. 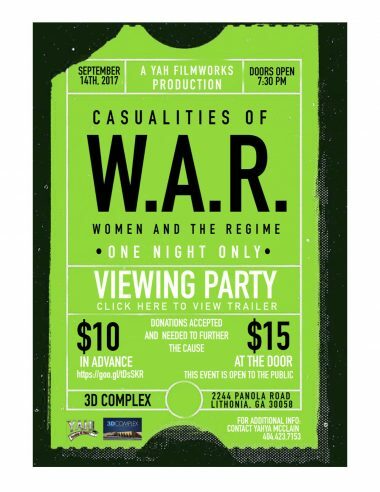 (Women and the Regime) – Purchase Your Tickets to the Documentary screening NOW | WHY Jonell PR? Go to EVENTBRITE and purchase your screening tickets. This event will sell out! Former Two-Time World Champion Boxer Yahya McClain is fighting the hardest fight of his life. He goes on a journey to expose the corruption in the family law court systems in America! This raw, gritty, hard hitting documentary investigates why a system meant to protect our children ends up hurting everyone involved. Through a series of intimate interviews and live coverage of different events, marches, protests, court proceedings, Presidential campaigns and more, this film shows the full spectrum. With testimonies from the average hard working everyday individuals all the way up to some A list celebrities and athletes like the National Basketball Association 1995 1st round draft pick Joe Smith, as he talks about the years of alienation he’s suffered along with the hundreds of thousands of dollars he has been forced to shell out. We also hear from a former Olympian and one of the greatest professional boxers of all time, Roy Jones Jr., as we visited his home in Florida. There is no gender bias at all when it comes to family law. We also hear the voices and see the faces of some women that have been alienated from their children for years! We interviewed some children and they had no problem sharing the nightmares they have had to endure. Some grew up to become lawyers, some became murderers and some attempted or successfully committed suicide! Learn how the majority of America’s social ills are due to parental alienation! Hall among many others. In between training and boxing Yahya co-wrote and co- produced The Soda Pop Dance Show, a teen dance show that aired weekly, live on cable TV in Las Vegas. In 1999 Yahya began training and advising Laila Ali. Securing endorsements with large company’s such as adidas, Ford, and Soft Sheen Carson to name a few. Yahya also spearheaded her entire boxing career. In January 2001 Yahya created the boxing event Ali Frazier IV (The Daughters 30 Years Later). The Ali Frazier IV fight was the first time in history that a women’s bout was the main event on a Pay-Per-View show. The event was projected to sell only 30,000-40,000 buys, but well beyond expectations, the fight sold more than 100,000 buys. through boxing, education, and mentoring. To ensure that kids are better equipped to be successful, upstanding citizens of society. In 1995 he began acting, but has since developed a strong passion for bringing his thoughts from script to screen. In 2010, Yah Filmworks was born, making it’s debut project C.I.G.A.R., a suspense filled drama about Corruption, Intellect, Greed, And Robbery. C.I.G.A.R., has appeared in multiple film festivals. In San Diego at the SDBFF, C.I.G.A.R. was nominated for three awards. In 2014, Yahya enrolled in the Art Institute of Atlanta as a full time student at the ripe age of 47, now dedicated to making movies that will impact the world. Short Film Award at the 10th Annual Peachtree Village International Film Festival in Atlanta. ← Who is the new cast member on Basketball Wives LA- Angel Love?